When I learned to fly, my flight instructor told me flying was boredom 95% of the time and the other 5% delivered sphincter-narrowing excitement. 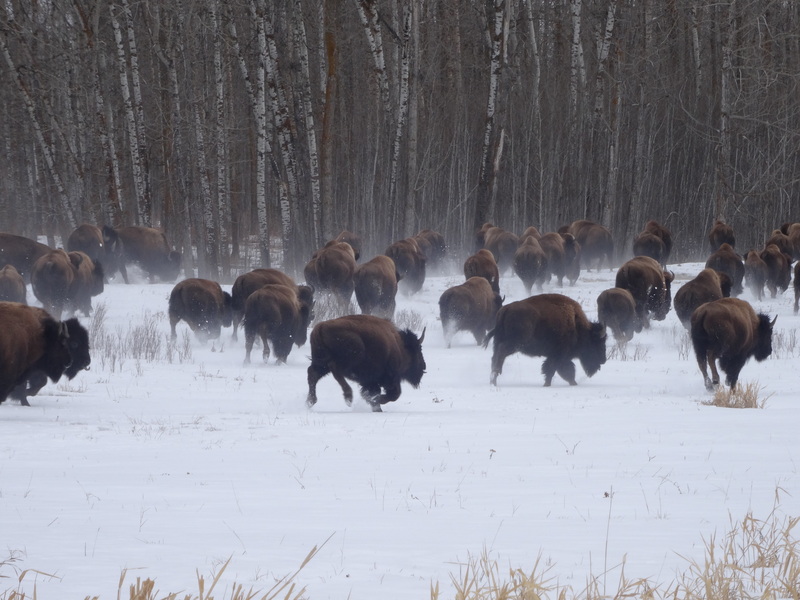 That phrase ran through my head as I searched unsuccessfully for bison in Elk Island National park. With over 460 plains bison in a relatively small park, you might think they would be hard to miss. You would be wrong. After two hours of driving back and forth on the 18 kilometer road that dissects the park I spotted nary a bison. Or a bird. Or anything moving. It was frustrating because I could tell by the poop scattered everywhere and the tracks in the snow there were bison around. “The best time to s ee them is at dawn and dusk,” suggested the Parks Canada visitor center employee. Unfortunately it was mid-morning and I would be long gone by dark. Daydreaming to take my mind off my lack of photos I crested a small hill and saw several vehicles stopped on the road. “Wildlife!” I thought. I didn’t care if it was a squirrel, by now I was happy to look at anything with fur or feathers to break my wildlife-viewing drought. I coasted to a stop and spotted dozens of brown shaggy behemoths jogging across the frozen grasslands. Bison! They were several hundred meters away – too far to photograph – so I grabbed my video camera to capture the movement. In the viewfinder I noticed the lead animals turning towards me. At the same time I thought, “they are coming this way” a stampede erupted behind my vehicle. Tons of plain bison thundered across the road, youngsters following moms and spunky teenagers kicking their heels in the air as they went. The snow flew up as they pounded across the plains, steam circling their dark heads. In seconds the reached a large stand of aspen and the forest gobbled them up as if they had never been. My racing heart told me otherwise. I love that 5%! Watch the action on this video.